Freebies include the daily breakfast and in-room Wi-Fi at the non-smoking Best Western Plus Truckee-Tahoe Hotel. Guests step into a lobby with mountain decor dark wood finishes and a stone fireplace at the two-story non-smoking Best Western Plus Truckee-Tahoe Hotel. The 100 traditional rooms supply guests with free Wi-Fi and cable TV as well as mini-fridges microwaves and coffeemakers. Start each day with the free breakfast buffet before hitting the gym or finishing work in the business center. Helpful extras include laundry facilities free local calls free parking and a 24-hour front desk. Pet-friendly rooms are available for a fee. 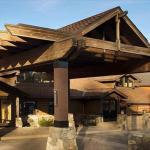 Less than two miles south of I-80 the Best Western Plus is 15 minutes north of Lake Tahoe's shores. Guests can find a few restaurants and shops in Truckee over a mile away as well as the Amtrak Station. Winter months draw the skiers to several area mountains within 20 minutes of the hotel including Northstar Ski Resort Sugar Bowl Ski Area and Boreal Mountain Resort. Summer months also keep guests busy with four golf courses less than 15 minutes away. Brush up on area history at Donner Memorial State Park and the Emigrant Trail Museum five miles away or keep the kids entertained with trips to the KidZone Museum and the Truckee Railroad Museum each less than five miles away. Reno-Tahoe International Airport is 37 miles northeast.